The Quins strengthened their league placing and survival in the Premier Division, with a fine deserved victory at the House of Pain, Sardis Road. History has shown that the Quins save their best performances against better Clubs and they don’t come any better than Ponty. Their 20 point margin is the biggest inflicted on them so far this season. The Quins have recorded two other victories over Ponty with totals of 32 points, November 19th 2016, and 4th March 2006. This performance is up there with the Cup Semi final in April 2010 at Bridgend with the score 41 – 12, and the Premier League win at Sardis Road by 23-0 in Sept 2004. 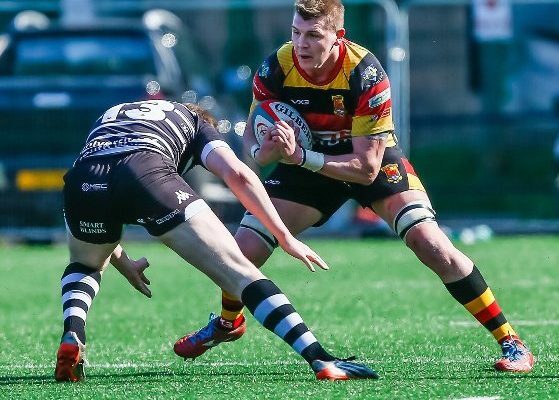 The Quins made 5 changes from the Ebbw Vale win last week. Both sides wanted to entertain and started well, with both sets of backs having early touches. Jac Wilson punished a home scrum infringement after just 5 minutes, with a penalty. It was from another scrum that the Quins set up an attack and went up the left for Morgan Griffiths to power through and find Dale Ford in support to round the cover defence and touch down under he posts. Jac Wilson added the extras. The home support were silenced further when Dylan Morgans tore away up the right and his neat chip over the full back to see him gather and race over for the Quins second Try which went unconverted. The Quins destructive tackling gave the Ponty backs little chance to make any ground and play was kept in their half for long periods. They managed to penetrate the Quins defence after 30 minutes when Lewis Williams found a gap to cross for a well taken try which converted himself to narrow the gap. The sides changed ends with the Quins ahead and looking confident in all departments. Shortly after the restart a powerful surge up field gave the Quins a set piece that they again controlled and from 5 yards out Lewys Millen picked up and his strength did the rest to go over for try number three. On the hour mark Ponty did manage an attack and wing Alex Webber was on hand to score. This was short lived as the Quins were now in control at both line out and scrum. They were able to use the rolling maul tactic, which the home side had little answer, and keep the ball for long periods to frustrate the home pack. Any home flare was cancelled out by the deadly tackling of the whole Quins team, keeping the usual home support strangely silent and none of the Ponty Ponty chanting was heard. Another Quins drive up to the home line was capitalised on when Dom Booth was on hands to crash over. Jac Wilson converted this bonus point score. The home side were demoralised, so much so that even their score board was out of action. With the game well and truly won, the Quins continued their rampant approach and Dylan Morgans was able to cross for his second and the Quins fifth try. Jac Wilsons conversion hit the upright and stayed out but the points were well and truly won to the delight of all Quins support. Next Saturday the team travel to Llandovery RFC for a the last away League encounter of the 2018/2019 season and the players are really up for this one.